Today, the Palace is a big part of Whiskey Row and has many faithful patrons that frequent it walls, with ma ny visitors having a meal and drink. According to the owner, employees and visitors, many rowdy and playful spirits seemed to have made the Palace their eternal home. At the Palace, there is an 1890’s picture of the bar with what looks like a ghost in the background. There are other stories of glasses falling off the rack for no reason, a plant on the bar suddenly falling to the ground, and a mannequin in period clothing falling over the railing at the top of the stairs while no one with up there. In the 1972 movie, “Junior Bonner”, many of the bar fight scenes were filmed at the Palace. There have been numerous reports of chairs flying across the rooms as wells as bottles by unseen forces, and the sound of glass breaking everywhere. The employees chalk it up to a prankster ghost recreating the bar scenes from the movie. Some have witness the ghost of Nevins, who owned the mortuary and lost it to the sheriff along with all his other possessions. Many feel the he is there to repeat that ominous game hoping for a different outcome. There are other ghosts seen at the bar having a drink by the patrons and employees of the palace. Click here to see a photo of a female ghost taken outside the Palace by a visitor in 2004. 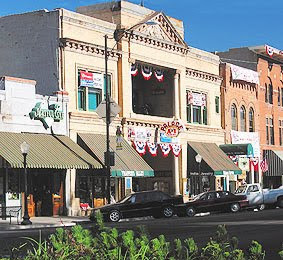 The next time you take a trip out West to Arizona, be sure to put Prescott on your list of places to visit. Check out its historical Whiskey Row and have a meal and a drink at the Palace. You might not be alone. On September 26-28th, Haunted Con will be in Prescott. I would love to go but probably won’t be able to. 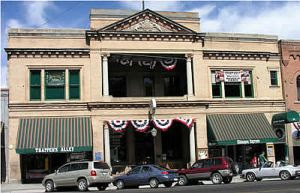 I will do a blog on the other many haunted places in Prescott towards the end of this month. Glad you covered "Pres-kit" (took me years to master that pronounciation). Every state has one of those. In Virginia, we had Norfolk. (Virginian's say "Nor-fuch"--friendly spelling). I love whiskey row and, of course, the Vendome Hotel with its incredibly scary "Abby's room." My friend, Debe Branning, is one of the speakers at HauntedCon this year. Looks like they have a nice lineup for it. It was originally going to be in Jerome, but I'm glad they moved to Prescott. There's definitely more space for folks to stay over. My favorite place is the courthouse. Whenever they have art shows there in the cooler seasons, I rush up to see them. It's like stepping back in time with the huge trees and green grass and old building. Sounds like a great place! I'm dying to visit AZ. Maybe next year. I love Prescott too. I also told Gary that if we move out of Phoenix, I want to live in Prescott. I love the old buildings, history, large trees and definately the weather. I would love to live on the street that has nothing but old homes or Thumb Butte where the homes have plaques on them, built in the 1800's or early 1900's and have lots of character. There always seems to be some sort of event going on there anytime of the year. This month it is Haunted Con and I'm trying to see if there is anyway I can go. If anything, it would be a nice day trip to Prescott for the festivities and cooler weather. I love, love, LOVE Prescott! There are two places I would love to live someday, somehwere near the shore in South Carolina or Prescott. One of the last trips we took before we moved from Phx was, interestingly enough, over Labor Day weekend up to Prescott. Wonderful article, Julie! Yha know, I'd just love to see that place. I really would. However, there is a real good chance that I never will. I'm way over here, and that's way over there. Would love to snoop around that ole' place of History. Who knows what I might find. A rather interesting Photo of the Lady in a Rocking Chair. Makes you sorta wonder. Really iam getting interested to visit Presscott after going through this article especially the palace Saloon.Its good to know that it hosts not only the meals or a drink but it has the most impressive furniture from all over the world.It is definitely an appropriate place for art lovers.But a meal or a drink wil be much more intersting and will give a royal feel in the palace.Even Cuban Cigars in the menu will add much more value to it. 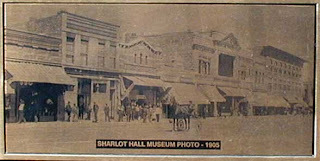 The fire that burned down Whiskey Row and most of Prescott was July 14, 1900 not 1883.